This week I made my first ever Jalie Pattern. I’ve been interested in trying them out for a while now, but when I saw @Lauren.Leigh ‘s Clara Leggings I stopped what I was doing and ordered the pattern. I made a size “T” with the only adjustment being shortening them a tad at the end. The pattern is MAGICAL! There is no center front seam and the leggings themselves are only one piece cut on the fold. They have a crotch gusset which makes for an, um.. flattering crotch fit, if you catch my drift. 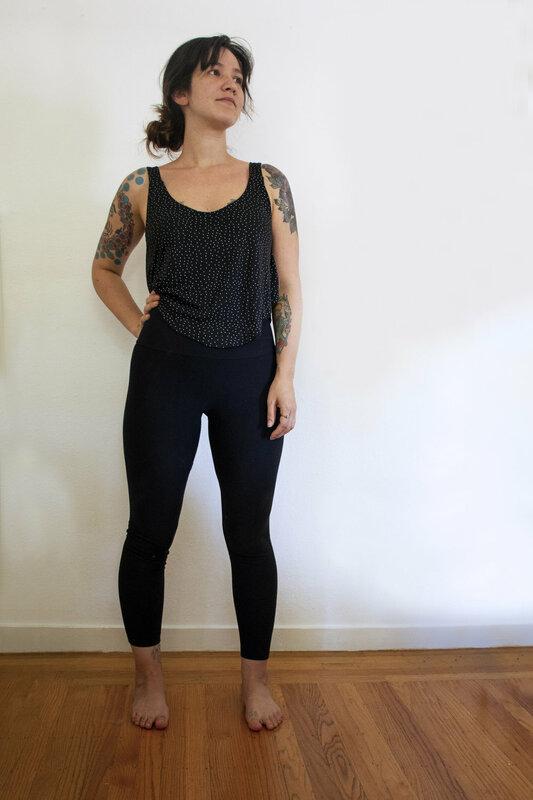 The drafting of the Clara Leggings is stunning, there is just something so beautiful about how they are engineered to fit so well. I will definitely be making more of these!!! My only qualm is that the instructions aren’t super easy to follow. They’re on the pattern sheet with the pattern and it took me a few minutes to wrap my head around where to start/what drawings go with which steps. Also this pattern comes with 27 sizes! Which is great, there are just a lot of lines on the sheet. All of that being said, the leggings are super easy to make, so it wasn’t a big deal. I’m wearing my leggings here with my Hilo Dress-Top! It’s the Hilo Dress but I cut two of the top layer instead of cutting a longer layer for underneath. It is perfect for wearing to hot yoga. I just wear a yoga bra during class and this flowy top is perfect for throwing back on after class when I’m sweaty AF. I freaking love Old Fashioned’s. OF’s are my go to fall cocktail, Hot Toddy’s in winter. I don’t really drink them in summer and have never made them at home. I got this cool, spherical ice cube tray and I’ve been wanting to take a stab at it. I followed this basic recipe and it turned out lovely! Although, now I’m at risk of turning into a real Don Draper. And lastly (and least interestingly) I cut myself a new set of bangs. Whenever I have done this myself in the past they have ended up funky and weird. This time I followed instructions that said to pull them tight in towards the center and rest your hand across the bridge of your nose as you cut. Anyway, I like the length and I feel ready for fall!!! Newer PostNew Pattern: Meet the Hughes Dress!